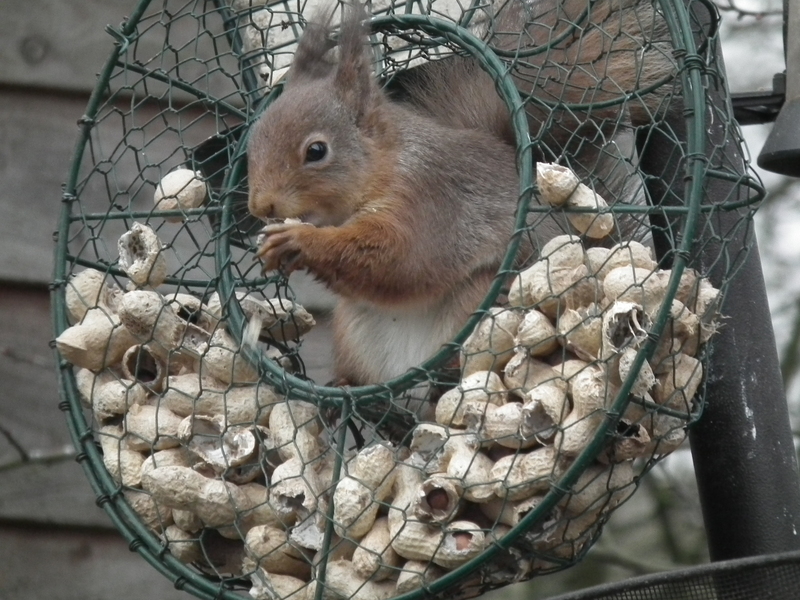 We put up a squirrel Peanut ‘Wreath’ first thing this morning and ‘our’ reds have been fixated on it. Although only a few feet from a feed box full of Super Deluxe Squirrel Mix ( including hazel nuts) , they have ignored this in the main and have been squabbling over access to the Monkey Nuts as their preferred breakfast choice. The one in the photo decided that sitting in the middle of the Wreath was preferable to swinging on it and certainly looks more dignified. Although we have yet to come across a Red Squirrel that does not adore Hazel nuts, we have noticed over the years from what customers have shared with us that Reds do have individual preferences as to what they eat. Dried banana slices are very popular with ours, but I know they ignore them elsewhere. We were delighted to see several Greenfinches on the feeders this morning. They have been a rare sight over the last 6 months and we were worried that the local population had been knocked back by the Finch Disease that does the rounds from time to time. It’s particularly prevalent during wet weather and this dry spell running up to Easter with increased bird activity is a great time to clean and dry your feeders to reduce the risk of virus’s and infections being transmitted between visiting birds. You can always give us a call at the Birds’ Bistro if you would like some advice on keeping feeding stations clean and healthy.